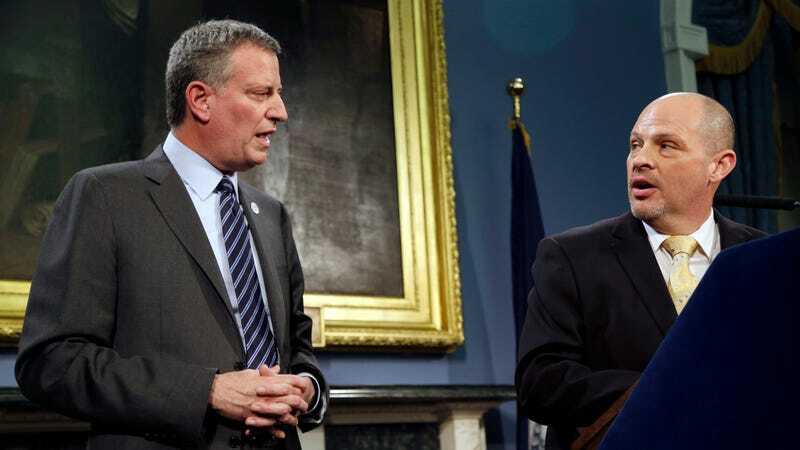 NYC Mayor Bill de Blasio and United Federation of Teachers president Michael Mulgrew in 2014. New York City mayor Bill de Blasio announced today that public school teachers will now get six weeks paid parental leave, which, uh, apparently they did not receive previously. Under the current policy, teachers who gave birth could use accrued sick time to cobble together a maternity leave. But teachers earn 10 sick days a year, so creating a three-month leave would require working for about six years without having been sick — or having a child who had to stay home from school because of an illness. Sick days could be borrowed in advance, but they would have to be repaid, a process that could take years. The Family and Medical Leave Act protects a worker’s job for 12 weeks, but offers no compensation. All parents will get six weeks; those who give birth can take paid sick leave as well, topping out at 12 weeks for for a vaginal delivery and 14 weeks of leave for a cesarean section. “We take great pride in taking care of children,” said Michael Mulgrew, president of the teachers’ union. “All we asked for was to be treated fairly when members of our own union bring children into their families. And it’s been a long fight.” Wild that it required a long fight!